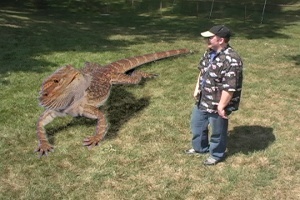 "Big Dexter" is the story of a -pet- giant bearded Dragon (14ft). Is Dexter the largest reptile ever? Probably not, that crown might go to an ancient monitor called Megalania priscus. Megalania priscus reached about 23 feet long, but Dex does out do most Komodo dragons that reach around 10 feet. 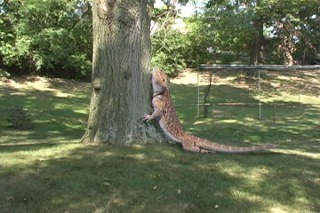 Be sure and watch the short film below detailing the story of this giant bearded Dragon. A pet dragon of this sort takes a lot of time and energy in which to care for them properly. The grocery bill alone would be just as big and impressive as big Dexter himself! 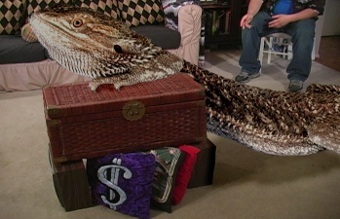 You're probably better off making sure your bearded Dragon stays a normal 14 to 22 inches. Now of course this short film was made in good fun, but can you imagine if prehistoric creatures -like the dinosaurs- somehow returned. Or if they had never gone extinct in the first place. Our world would be a much different place, seeing as how we would have to share it with giant creatures that could be extremely dangerous. Having your very own 14 foot pet dragon could have its advantages. For one thing- the school or neighborhood bully might pick on someone else. You would have a fairly good reason for finally building that castle you've always wanted. A giant dragon could become profitable, if only to give the neighborhood kids a ride on it's back for a dollar each. -And you know the National Geographic Channel would probably do at least a half-dozen documentaries about your pet giant bearded Dragon. Big Dexter may not be the largest reptile ever, but who's to say he's not still growing? Maybe he has Godzilla-like proportions in his sights. He could get to be 60 feet or more, especially with his imagination at work. By the way, why are you still reading this? The short film "Big Dexter" is waiting to be seen towards the top of this webpage!